One thing that’s clear for small businesses, especially those small businesses run by only a handful of people from a laptop, free Wi-Fi fuels more businesses than we care to think about. But where can it be found? JiWire’s Free Wi-Fi Finder will be a big, but not perfect, help. JiWire’s Free Wi-Fi Finder app, available for iOS, offers users a quick and simple way to find that free wireless internet that small businessmen have often taken advantage of, as well as those who work remotely for any of a variety of reasons, like sales reps and the like. 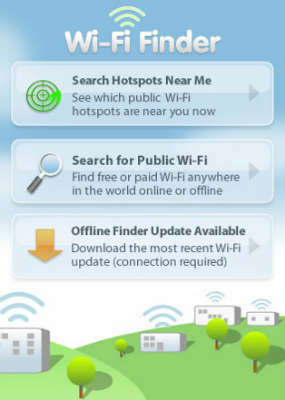 The Free Wi-Fi Finder will not only allow users to search for Wi-Fi hotspots based on their location, but also based on any predetermined criteria you may like, like address, city, or ZIP code. From there, you’ll have access to a touch screen-capable map that will let you drag and zoom your way to finding that sweet, sweet Wi-Fi. There will even be an offline version you can use when you need to find Wi-Fi to get connected in the first place. The up shot here is that, should you be looking for Wi-Fi, you’ll have an excellent chance of finding it with this. When you’re in an unfamiliar location and need that fast connection, but aren’t near, say, your hotel room, you’ll be able to find it with this. The down side, however, is that the results aren’t always a hundred percent accurage. For example, I checked out locations near me, and found that at least three locations I knew of that had Wi-Fi didn’t show up on Wi-Fi Finder. Worse yet, several locations that had Wi-Fi no longer do, by simple virtue of the fact that they no longer exist. 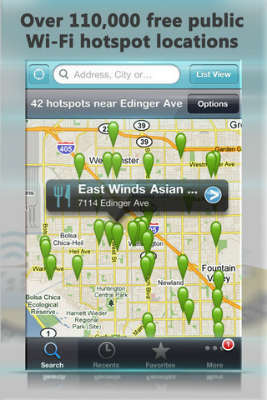 Depending on the search results from JiWire’s Free Wi-Fi Finder will end in frustration. At some point, you almost certainly will go some place that no longer has Wi-Fi access, or you will fail to go somewhere that does. Just how frustrating that will be depends on a variety of factors, like location, degree of need for the Wi-Fi hookup, and distance from your current location to potential substitutes. That is to say, it may be virtually no frustration, and it may be one step from disaster. Still, for the kind of connectivity that powers the great things we know and love–including those great cloud-based telephony functions like digital fax receiving and meet-me conferences–Wi-Fi is a very welcome connection indeed, and JiWire’s Wi-Fi Finder will do at least a reasonably good job of helping users find that so very vital connection. This entry was posted in Android Apps, iOS Apps, Phone Apps, Small Business, Virtual Office by Steve. Bookmark the permalink.